It was my last week of work, and I returned to Balata Refugee Camp to say goodbye to Mahmoud and Fayez. They work at the Yafa Cultural Center, a non-governmental organization that runs education and cultural programming for the camp’s children. 25,000 people live in the two square kilometers that make up Balata, the largest refugee camp in the West Bank. Balata’s streets are home to squat hardscrabble buildings, and its alley walls are decorated with peeling martyr posters. We refurbished Yafa’s computer lab in the fall of 2008. On a rainy October day, I cut the yellow ribbon taped across the lab’s doorway with Souad, Yafa’s youngest member—a five-year old girl with pig-tail braids. On the sunny July day that Mahmoud, Fayez, and I said goodbye, the bright yellow-painted lab was filled with children. In pairs, they sat in front of flat screen computers, one manning the mouse and the other the keyboard, and listened to their teacher’s instructions. 1600 people use the new computer lab on a monthly basis. For two years, I worked in Jerusalem for Creative Associates International, a Washington DC-based development company that implements U.S. foreign assistance programs worldwide. My job was to design and implement a small grant program to support grassroots Palestinian leaders who were working to improve life within their communities. Beyond professional goals and responsibilities, though, my work was a chance to test out the concepts of citizen diplomacy that I have been thinking about for almost a decade. My concepts were basic. First, regardless of nationality, most of us share common human interests related to rights, needs, and aspirations. Second, private citizens can form mutually beneficial partnerships based upon these shared interests that impact challenges like learning to read or finding a job and that transcend national disagreements or conflicts. Third, by treating “the other” with respect, people can challenge hardened stereotypes even if they disagree about those same international conflicts or other personal opinions. 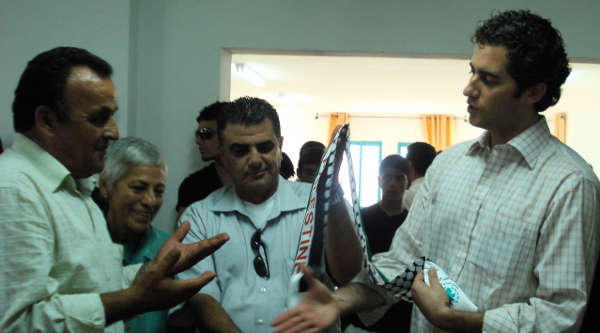 Over two years, I visited more than a hundred NGOs in Palestinian villages, towns, and refugee camps in the West Bank. Many times, I was the first American that villagers came to know; other times, I was the first foreigner to visit since the start of the al-Aqsa Intifada. For hours, I sat with local leaders and learned about their communities and the specific challenges they faced. In empty youth clubs, dark training halls, and women’s centers built from cinder blocks, we figured out how to support local organizations that were trying to address their community’s education and empowerment problems. In more than 70 different organizations like the Yafa Cultural Center, we installed small infrastructure projects, like computer labs or continuing education halls, or we purchased equipment like bagpipes and soccer balls for scout troupes and sports teams that built community. In the process, I became an unofficial ambassador. I gave speeches in Arabic, ate meals in partners’ homes, and argued, respectfully, about U.S. foreign policy in smoke-filled salons. As a professional working in international development, I had specific skills—I could speak Arabic and manage a grant program—that enabled me to help local leaders improve their communities. In the process of going about my work, though, I saw that there was a lot of room for others to contribute, too. Youth clubs needed trainers and English teachers. Women’s centers needed computer instructors. Community based organizations needed help with designing websites and writing proposals. These didn’t have to be two-year commitments—in some cases, a couple of weeks or a summer or a semester would do. I looked at the results of my work and I saw the potential to multiply the impact and the positive feelings with waves of volunteers, be it skilled or unskilled, who had something to offer and who possessed that desire to build goodwill. The computer labs and halls that we built or refurbished improved the lives of thousands of people, but something else happened too. On that first day that I visited Balata, I never would have guessed that I’d make a special trip to hug Mahmoud and Fayez goodbye, or that Mufida, a council woman from a village northwest of Jerusalem would sew a traditional Palestinian wedding gown for my wife out of gratitude for our support of the village’s new women’s center. I wouldn’t have believed that several dozen people would spend up to six hours traversing checkpoints and closed roads to come to my goodbye party in Ubeidiyah, a small town east of Bethlehem where mirage-like vistas of Jerusalem hover above the haze of Wadi Nar, the valley of fire. My goodbye party was in the hall that we refurbished for the Local Council, and there was food, speeches, and debka, traditional Palestinian dance. Somewhere on the Internet, there is a video of us all dancing. Such was the impact of our partnerships. You end up dancing with friends on a stage that you helped build in a small town next to the valley of fire, where olive trees grow from stones and sheep peck at patches of wild grass under a setting sun. You look at the crowd of people you came to know through partnerships not just of words, but of accomplishments. And you see that your work together changed people’s feelings and lives—and your life, too. Benjamin Orbach is the Director of the America’s Unofficial Ambassador initiative at Creative Learning, a Washington DC-based not-for-profit. The author of Live from Jordan (2007), he is writing his next book, America’s Unofficial Ambassadors. America’s Unofficial Ambassadors is a citizen diplomacy initiative that is increasing the number of Americans who volunteer on a short-term basis in the Muslim world. This article was originally published in the Diplomatic Courier’s September/October 2012 edition.